For kids, education usually means sitting in a classroom, doing homework, and taking tests. But in Arizona, there are many educational activities that take kids out of the classroom and into a different world. You can find everything from interactive learning exhibits to tours of the great outdoors. Here are the 10 best educational children’s activities in Arizona. The Arizona Science Center is a massive, 164,000-square-foot learning center in the heart of downtown Phoenix. The Science Center includes interactive exhibits that combine learning and fun for all ages. You can star gaze at the Dorrance Planetarium, learn about the art of flight at Flight Zone, or augment reality in the My Digital World exhibit. In addition, the Science Center plays host to a rotating list of featured exhibitions that ensure no two trips are the same. Lowell Observatory has been a key astronomical observatory for over 125 years. Lowell has been the site of many big moments in astronomy, including the discovery of Pluto. Now, kids can get in on the fun at Lowell Observatory Camps for Kids. LOCKs is a hands-on day camp for kids ages preschool to middle school. The camps include learning based activities revolving around science investigations, games, engineering, and more. Two words: Space camp. Challenger Space Center gives kids a chance to explore space like an astronaut. The center, created in honor of the Challenger Space Shuttle, also has many weeklong, half and full day camps for children up to eighth grade. Kids can check out real gear from space shuttles, autographed astronaut memorabilia, and a life-sized Iridium satellite model. The i.d.e.a. Museum is a place to let your imagination run wild. This interactive museum has exhibits devoted to art, science, and technology. I.d.e.a. has three main exhibit areas where kids are encouraged to play and get creative. Kids can create artwork at the Hub, experience glow in the dark in the Blacklight Room, or explore artwork in the Whiteman Family Exhibition Gallery. The Children’s Museum of Phoenix isn’t like most other museums. Unlike many museums, this museum encourages kids to touch everything. The Children’s Museum of Phoenix has over 300 play experiences spread out across three levels. Their educational programs are geared towards kids up to 10 years-old in the areas of arts and culture, learning through play, health and wellness, environmental awareness, and tolerance and understanding. 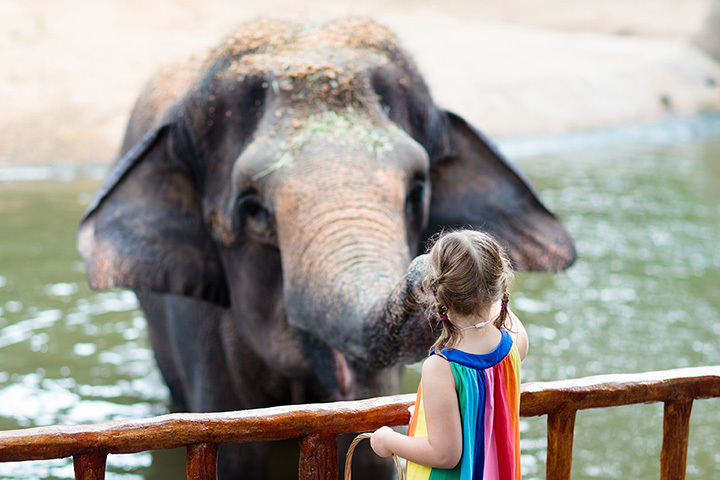 The Phoenix Zoo offers kids the chance to get up close and personal to over 1,400 animals. The zoo hosts a variety of educational programs designed to get kids more connected to the natural world. Kids also have the chance to participate in their Critter Keeper program. The program lets kids experience the life of a zookeeper by cleaning, preparing food, and getting up-close animal encounters. The AZ Heritage Center is a cultural center showcasing the various aspects of life in Arizona. Kids can take a tour of Arizona’s history by exploring the frontier days up through modern times. They can also learn about the intricacies of living in a desert as several exhibits go into detail about natural resources. This is fun for the whole family whether you take a guided, self-guided, or activity related tour. Of course, all learning doesn’t have to take place indoors. Kids can get a truly unique learning experience by taking a tour of Kartchner Caverns. The best tour for kids is the Rotunda and Throne tour. This 90-minute tour showcases the role of water in cave creation, information about bats, and the many stalagmites and stalactites that line the walls. Afterwards, kids can check out world-class exhibits in the Discovery Center. The Phoenix Art Museum is the largest art museum in the southwestern United States. The museum houses over 18,000 pieces of art from all over the world. It’s also kid friendly. Kids can take part in their own scavenger hunt while exploring the various collections and galleries. They can get their first exposure to everything from modern and contemporary art to photography in this epic museum. The Desert Botanical Garden is home to over 4,000 species of desert plant life and world-class exhibits. Kids can explore the garden and learn more about flora and fauna of the Sonoran Desert by participating in their scheduled programs. Kids programs include guided tours, independent learning, and garden camp adventures.